There’s a number of factors that go into how quickly you will rank with google and your placement on the list. Like any other business your goal is to be number 1 on the list because I’m pretty sure you consider yourself to be an expert in your industry and you want your traffic to reflect that. There are two directions of search engine optimization. You can rank high for a local presence or you can rank high for a national presence. Is 1 more difficult than the other? Yes, it is and that as well depends on your competition and how targeted you are with your search engine optimization efforts. 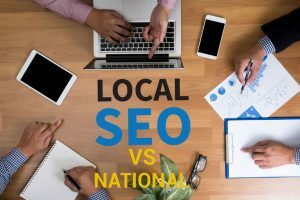 The remainder of this article is going to break down the difference between local and national marketing and to help determine if you are gearing your efforts in the right direction. I hope that after taking the time to read this that you’re equipped with enough knowledge to either affirm what you have done or make corrections to a more promising future concerning your online marketing strategy. Local SEO is the ability to be found through google when someone searches a keyword in a particular area and your business comes up because you are in the area or the state. Local search engine optimization is great for businesses that have a physical presence or provides a service to a particular area. Generally if there are companies that provides the service or product that you are looking for your website should pop up in the local searches. How do I get my website to rank with google local searches? It’s very simple, create an account on google my business. After creating your account you will be able to input all your business information details inside of the google my business profile. Make sure your information is consistent across the board from social media pages, directories that your business maybe listed on, and most importantly your business website. Google will send a postcard to your address of the business for verification. The post card generally arrives within 3-5 business days. 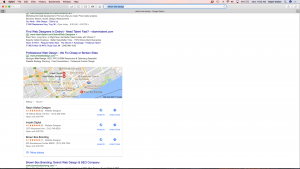 How quickly will my website rank with google local searches? Your ranking all depends on the competition in the area and how well there profile looks. The more reviews and information a business provides inside there Local search profile then the better the chances. In Detroit with so many companies not having the understanding of how local searches work then the competition is pretty low so your chances of ranking quickly is higher than other markets. Below is a list of how you can quickly rise your local profile on google. 1. Create a great local business profile with a great description and keywords that describes your business. 2. Get your customers or clients to make reviews about your business. 3. Make sure your business information is consistently the same across all platforms. 4. Place a google map of your business on your website. I rank high in google local rankings, but I’m not on the first page of google organic search list. There’s a lot of work that goes into ranking and not only ranking, but sticking to the first page. Blogging is going to be the best way to rank well on the organic list of google for your keywords. Be consistent in giving free advice. Your in competition with so many others. What’s going to set yourself apart from your competition? Allow your potential customers to have the opportunity to trust you before they walk through the door. Free advice and good free advice shows that you care about educating your potential customers about your product. Does Social media play a role in how I rank with Google? Yes, it plays a small role, but all directories that allows revolving content play a role in how well you rank with google. Revolving content is continuous changing content. All roads lead back to the blog. Social media is a great tool to lets your followers know that you have new content and gives your readers a opportunity to share your content. Having good follow links on your website that link to other pages within your website also helps facilitate ranking with google. The blog allows you to talk about and break down your services more than the static content on your website currently does. We have a blog post called “Does My Website Need SEO?” This post gives more in depth information on how to properly do on-page SEO and what on-page SEO is. After creating a great local website presence going national will not be that hard. The reason why getting national website presence is harder than local, besides competition is trust. Google has to trust what your doing is legit and you have data that backs that up. Hence why blogging, social media, & reviews are so important. Very well explained! I agree that blogging or the quality content is always the best option to rank higher on google search result. Staying on the first page of search engine requires efforts. And Social Media profiles also help to achieve the same. The contrast between moving forward in the realm of business and being abandoned is regularly because of the quality of the brand and without an imaginative main impetus, a business character frequently won’t draw in or thunderous with potential clients. You should do your exploration while picking a branding agency on the grounds that not all will have the capacity to coordinate your vision and position your business in the way in which you are seeking after. Moreover, you can also hire Internet Marketing Company Atlanta for your marketing needs.